We are proud to announce that the Paradigm SHIFT Series A2 and Paradigm Reference Studio 10 have both been named Editors' Choice Award winners by The Absolute Sound, as published in the Guide to High-Performance Loudspeakers 2013! The Guide to High-Performance Loudspeakers 2013 is a thorough 115 page document, featuring some of the best loudspeaker coverage from TAS during the past year, as well as a number of other features, such as: Sneak Previews, Further Thoughts and Editors' Choice Awards etc. "The Paradigm Shift A2 represents a very high order of value and performance - incredibly versatile for small-room, family-on-the-go, and impromptu listening anywhere there's an outlet. Frankly only a dog is more companionable than the A2." internally powered, and equipped with DSP bass management and enough back-panel inputs to connect to almost any source, this is what 21st century entry-level high end is all about. A combination of sound and value, it extends the welcome mat to budding highenders who may have felt they couldn’t afford the entrance fee." "Now in its seventh generation, Paradigm’s Monitor Series is one of the benchmarks for good-sounding, affordable speakers that... offer tremendous across-the-board performance, musical satisfaction, and value. Which, of course, are the very traits that have made this Canadian firm’s designs such a success over the past quarter-plus century." "Paradigm’s diminutive Studio 10 is inherently warm and full, with a remarkably large presentation that will appeal to a wide range of listeners. It’s not the most transparent design, but is nevertheless lively and involving. 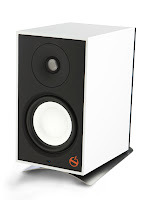 This front-ported two-way can sit on a shelf, but performs best on a rigid stand placed somewhat into the room." the Guide to High-Performance Loudspeakers 2013.